This is Bertha Mason. I adopted her from a guinea pig shelter (yes, those actually exist!) as a companion for Beaver, whom I introduced in a previous post. Bertha’s not really into classic films. She prefers Nicholas Sparks adaptations. The Notebook is her favorite (also that one with Miley Cyrus). When she’s not binge-watching Game of Thrones or The Walking Dead, she likes to read James Patterson novels while jammin’ out to Kenny G. on her iPod. 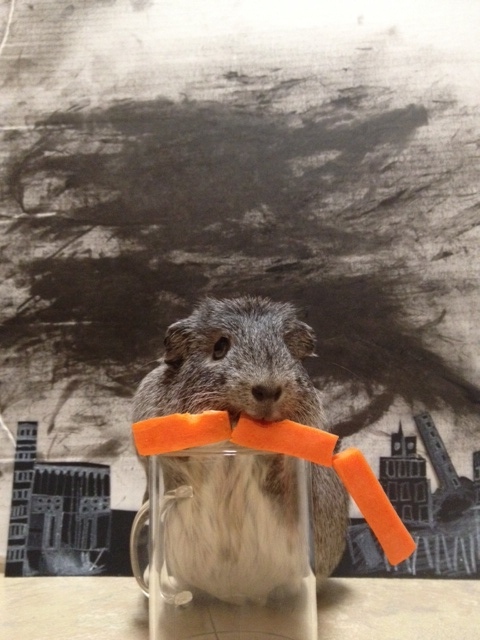 Bertha chowing down mercilessly on a carrot train. Sadly, she and Beaver didn’t get along. He’s laid-back and Bertha has a dominant personality, so she drove him crazy (hence the name). Thanks to an unexpected new roommate, though, everything ended happily. But that’s for another post. Now back to the film. The original Godzilla came like a kick in the gut for its target audience, which was still reeling from the Hiroshima disaster and operation Castle Bravo. Hydrogen bomb tests destroy a harmless sea creature’s natural environment. Radioactivity deforms it into a giant voracious monster that emerges on land to forage for food — i.e., humans, and a couple of cows. 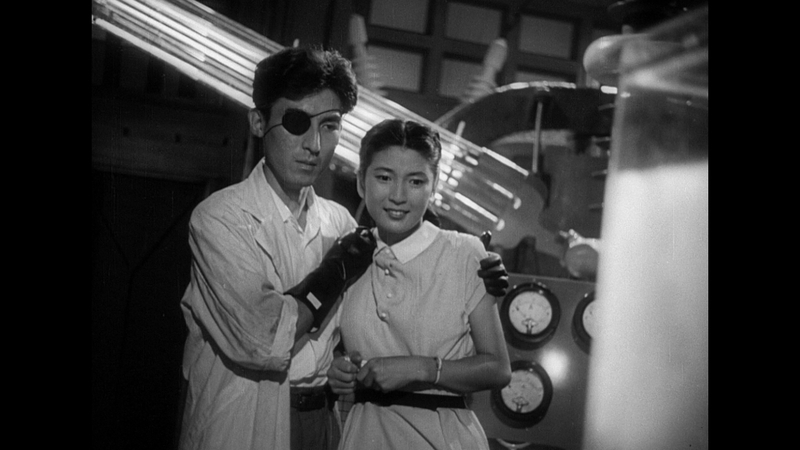 Daisuke Serizawa, the eye-patched scientist, refuses to kill it with his top-secret formula. Kyohei Yamane, a prominent archaeologist, wants to keep Godzilla alive for research … which would make sense if they had any way to contain it. Yamane’s daughter, Emiko, goes around crying (although it looks more like she’s trying not to laugh), and tripping at crucial running-away-from-Godzilla-moments. Emiko and Daisuke observing The Oxygen Eliminator’s effects in pure terror. I thought ———— SPOILER ALERT!!! ———– Serizawa’s sacrifice in the end was needless. They could have pulled him up with the rope after he detonated the Oxygen Eliminator. Maybe the producer was trying to make a point — the scientific community suffers when its discoveries are manipulated for personal gain. Godzilla surprised me. I walked in expecting a goofy, B-type film with no substance, just shots of a monster terrorizing Tokyo. Instead I saw a sombre, dialogue-driven film denouncing war and atomic weapons. The acting is powerful, the dialogue thoughtful, and the special effects — for the most part — are impressive for the time. Godzilla depicts the toll weapons take on society, regardless of their shape. If ever there was a film promoting peace, this is it. 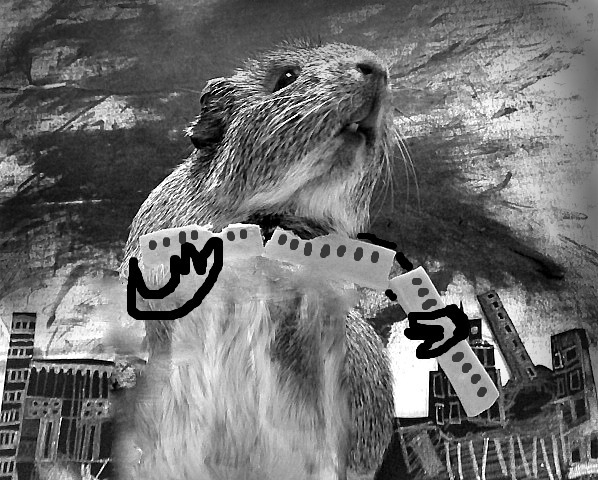 This entry was posted in Entertainment and tagged 1954, atomic bomb, Bertha Mason, Diasuke Serizawa, Emiko Yamane, Game of Thrones, Godzilla, guinea pig, Hiroshima, Hydrogen bombs, James Patterson, Japanese, Kyohei, Miley Cyrus, Nicholas Sparks, operation Castle Bravo, Original, Pigzilla, Walking Dead by Jasmín. Bookmark the permalink. Have either of you guys heard of the movie On the Beach? It has Gregory Peck and Fred Astaire. Weird combo, right? It’s based off of a book by the way. I haven’t heard of it, and that is an odd combination!